Just a small one this morning. A facebook fan, Jules, of the MM group posted these 2 pictures this morning that she took while shopping for girls clothing (girls, not women) in Lulu's recently. 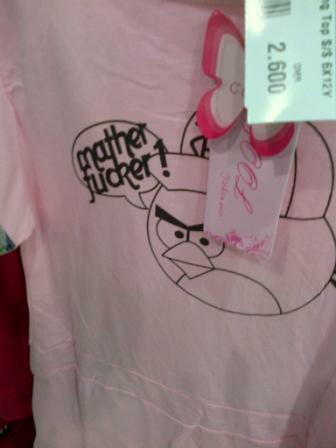 According to the Manager it's perfectly acceptable because the o in mother is actually an a. I'm sure the owners of the Angry Birds trademarks are happy about that too. Well I'm glad thats ok then! Also, totally unrelated.... if you happen to be a fan of Sean Paul, he'll be at the Hi FM studios in the MGM today at 4pm. Woah!! i wonder how it was allowed to be imported! Yes, because 'mother' is the word that needs disguising and 'fucker' clearly isn't a problem.... epicfail by so many people at so many levels. This is really classy...lol. 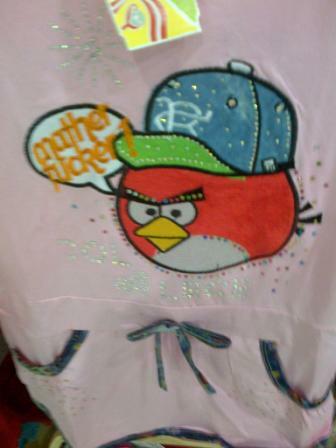 My kids are into crazy birds right now but fortunately too young to read! That's a special one. I'd add to that all the fake football shirts sold openly in Lulu stores, complete with correct advertisements for online gambling websites, or in one case, no longer current advertisements for a Danish beer. However, try putting a khanjar in a logo without permission! Meanwhile, Consumer Protection is doing the important job of making sure hotels don't compete with each other by discounting prices....ah...if only they would listen to me. Hi,how the hell can I mail you??????? Hope this finds you OK. I have just posted a "review" on Amazon. I have had just about enough of receiving crap products from them. They blame the couriers (Aramex), the suppliers (when ordered direct from them) blame Aramex. I know that Aramex are not without blame in certain quarters as regards delivery times/dates/locations but I rarely have to complain about condition of goods, except from those ordered through Amazon. I know many people here in Oman have had good service from this company as have I, but only when I order DIRECT from them! Order through an outside company whom they deal with and it becomes a lottery. To date I have had an Android Tablet delivered with cracked screen, a whole bare-bone Shuttle PC that not only failed to POST but the CPU was proved to be faulty!!! Now this dash-cam as seen in the video. I did not connect there being a problem until these last items when it dawned upon me that there may be a pattern here. I don't know if you want to put this out on your blog, but I think there is a real problem, but don't quite know where to go from here. I will be interested if Amazon actually show this video.